For its annual Black Friday concert, the BSO offered all-Beethoven: his Fourth Symphony in B-Flat Major, Op. 60 and his Fifth Symphony in C Minor, Op. 67. Andris Nelsons conducted the hour-and-a-half concert to a sold-out hall. 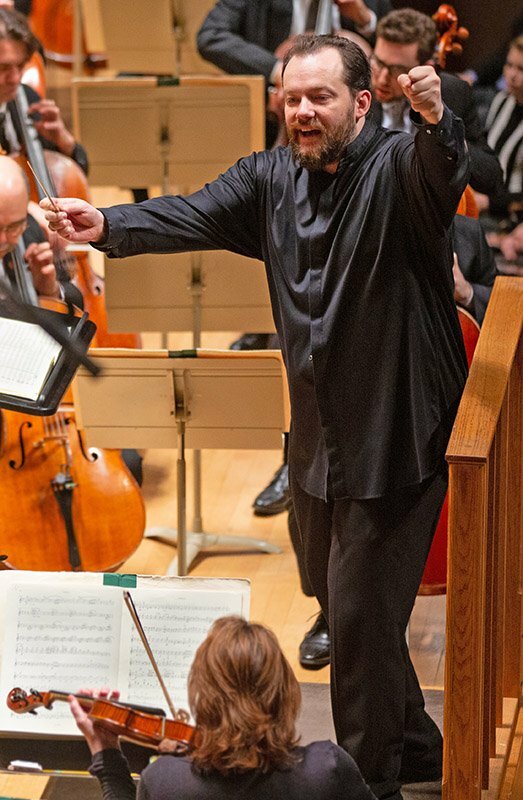 First, a few non-musical comments: as one who ventures to Boston from San Francisco only once or twice a year and who therefore hears the BSO with roughly the same frequency—with nearly uniformly positive experiences—this time brought a few entirely avoidable disappointments. The concert started nearly ten minutes late; this is out of character for any major orchestra and especially the BSO. I had tried to come in with an open mind, but the fact that the hall was pandering to the home-for-Thanksgiving throng who couldn’t make it to their seats by the posted time made me wonder if Nelsons chose the repertoire purely to please them. When the pianissimo introduction to the Fourth Symphony finally started, a veritable chorus of coughing, creaking chairs, and thudding objects that lasted at least a minute resounded throughout the hall, reducing the distant, ethereal B-flat minor harmonies to an altogether secondary backdrop to some new kind of sub-verbal communication. And during the faintest moment of the same symphony, the end of the second movement when the timpani alone is playing an almost imperceptible dotted rhythm following a grand tutti fortissimo, a high-pitch ringtone evoking a triangle added a comical element to the orchestration of one of the most original and haunting sequences in the whole work. The two Beethoven symphonies, one that needs no introduction and one that remains obscure and rarely played, made for a somewhat odd combination. Would the Fourth simply be a throw-away act before a main event? Even though it did at times present undeniably Beethovenian sounds, in short, yes. Perhaps Nelsons intended to showcase the scope of the composer’s musical evolution? No, he completed the Fifth only two years after the Fourth, and in fact started sketching it two years before he began work on the Fourth. So perhaps the lesson is that one who writes a symphony in a few months makes compromises—even Beethoven. The Fourth begins with an other-worldly introduction that deserves something more interesting than what follows. There’s a metronomic feel, but it works to reinforce the muted, bloodless quality. The listener thinks that what follows will bring equal profundity, but a sudden modulation proves otherwise. As the altogether contrasting, lively first theme begins, tempo remains equally strict but introspection yields to mirth. The first entrance of the woodwinds, five bars into this theme, was not entirely together, nor did the articulation of the repartee between first and second violins in the transition to the second theme come across as perfectly clean and witty. This in itself wouldn’t be worth noting, but it was the first hint to the perfunctory nature that came to characterize the performance as a whole. As the second movement begins, there’s still no tempo freedom despite the focus on a lyrical cantabile melody in the first violins. Actually, we heard less focus on it than I would have liked; a dotted, staccato countermelody kept stealing ears. This rhythmic motif is important to the rest of the movement, but it has plenty of time on its own. The primary melody should have been allowed to shine more on its own such as in von Karajan’s 1963 recording [HERE]. Enough on the Fourth Symphony. Yes, there were nice moments, but it did not seem so much like a combination of individual performers’ or sections’ feelings as it did homogenous blocks of sound. Although Nelson’s extracted plenty of dynamic range (the pianissimos warrant special note), nuanced shaping of individual lines went AWOL. Metronomicity pervaded throughout. The Fifth Symphony’s unforgettable opening “fate” motive presents an interesting challenge. Marc Mandel’s notes state that “by now, most conductors seem to realize that the first three notes of the symphony must not sound like a triplet.” And yet, the initial notes under Nelsons, with their speed and emphasis on the first of the three, sounded decidedly triplet-like. Perhaps only Furtwängler’s 1947 interpretation [HERE], with its absolutely unaccented initial upbeat, can unambiguously reach this end. But does it really matter? As soon as the music progresses beyond the fifth bar, the notation becomes clear. The development section could have used a bit more freedom in tempo—a recurring theme of this concert—but the coda felt wonderfully dramatic and fatalistic. The second movement began with marked tenderness. I initially thought that it had room to go even a bit more in that direction, but I came to appreciate the careful juxtaposition of intimacy and distance. In contrast with certain parts of the Fourth Symphony, the wind section here was very clear and together now. The bassoon solo in the final stretch was haunting. In the third movement, the fugal section lost a bit of the clarity that had come to distinguish the performance thus far, but the transition to the fourth movement unfolded with true magic, producing an immediate release—like you’ve made it through hell—and despite the whirlwind that follows, transparency prevailed. The recap of material from the third movement was rhythmically precise and evoked careful tiptoeing. And the crescendo into the final chords gave us every bit of excitement we could have wanted. The second half of the concert brought redemption with a conventional yet clean and well-executed rendition of the Fifth Symphony. Here, performers seemed much more alive and individualistic. Urgency and presence existed in every moment; what they were playing was the most important thing in the world. Currently active in the San Francisco finance world after having received a BS in mathematics and physics, and a BFA in music in 2012, Nathaniel Eiseman designed this site in 2008. I attended this program on Tuesday, 27th. The 5th is the best symphony ever written. Period. I wasn’t impressed. It must have been me as everybody else left the concert with smiles and exuberance. The 5th is burned into my brain via a DG recording from von Karajan. I thought notes, especially at the end of various phrases, were thrown away by the orchestra with deference to tempo. Parts of the program were very nice but as a whole I wasn’t wowed. I thought the orchestras Enigma variations (not on the program) were the best I ever heard anywhere. I’m not a BSO naysayer..
As I’ve commented before, the 4th is the worst symphony Beethoven ever wrote. So maybe they did it justice. Poor 4th. One I love dearly, and finally got to play last spring.